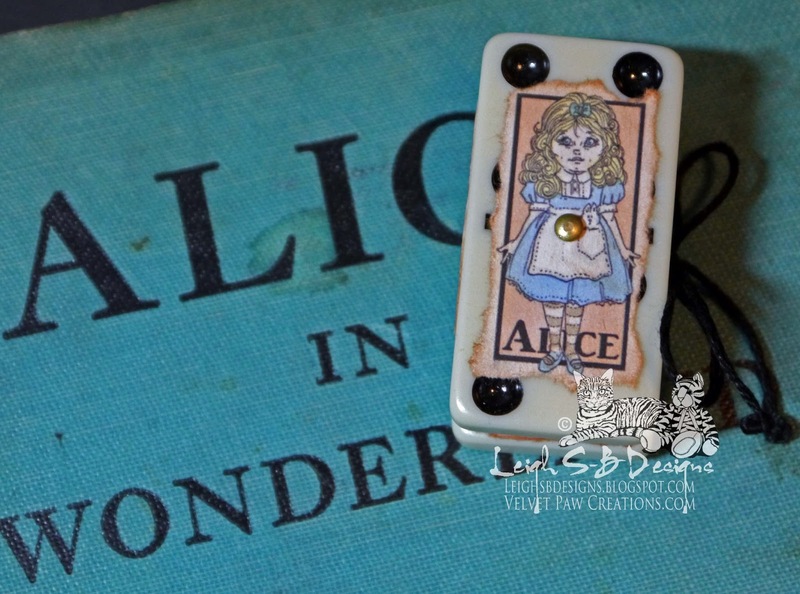 Velvet Paw Creations: "Vintage Alice Illustrations" Spinner Domino Book and Birthday Celebrations News! "Vintage Alice Illustrations" Spinner Domino Book and Birthday Celebrations News! Here's a list of everything so pop on over and join the fun! I used the 'Alice' image for my covers and the 'Through the Looking Glass' pages for my book. The images were printed out onto white paper and torn to create the ragged edges. I coloured the covers with Copic markers but left the pages uncoloured so that they'd look like illustrations in my vintage copy of Alice in Wonderland by Lewis Carroll. After accordion folding the book pages I aged them and the covers with Tea Dye Distress Ink. The dominoes I used are a yellowish cream colour and are slightly smaller than a standard domino. These particular ones are called Spinner Dominoes because they have a brass pin in the center of the domino face which allows them to spin around. I decided to adhere the book covers to the face of the dominoes so that you can see the pips, that's what the dots are called, and I stuck the brass spinner pins back in afterwards too. I also decided to make this one into a more traditional book with a spine so glued the backs of the pages together. Before adhering the pages to the dominoes I added two lengths of black embroidery floss as my tie closure then adhered the pages to the dominoes with Judikins Diamond Glaze. I completed my mini vintage book with the title and the author's name, Through The Looking Glass by Lewis Carroll. I actually scanned a page that only had half a page of text on it from my vintage Alice In Wonderland book into Photoshope CS6 and typed out the text using the same font as the book in the blank area. I printed it out, tore the edges, treated them with Tea Dye Distress Ink and adhered the pieces to the spine of my domino book. I then tied the black floss into a bow to close the book and knotted the ends. Love your vintage Alice book!